The Orbis APD (Air Particle Detector) Computer Based Trainer is an example of how Orbis created a multifaceted and flexible software training program for the military. The APD is a device for detecting and monitoring radioactive particles suspended in the air. Air samples are drawn through the equipment then filtered and measured for radioactivity. Measurements are compared against user configured thresholds, and radiation detection alarming is triggered when thresholds are exceeded. 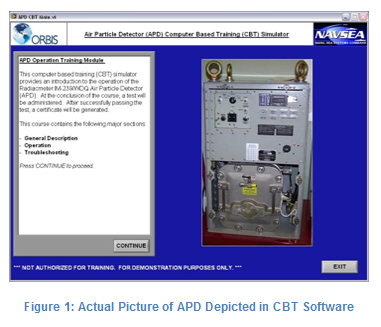 In order to better support complex APD operator training and maintain readiness, Orbis developed a LabVIEW computer based training (CBT) software application. A simulated APD front panel was created to duplicate the look and operation of the actual physical device. Careful attention was given to ensure front panel buttons, switches, and indicators were closely replicated in the APD CBT software. The LabVIEW graphical programming language allowed for the easy incorporation of several APD hardware features, like switches and buttons, since templates are already integrated for use in the programming language. The high degree of resemblance between the CBT and the actual device is in keeping with the military’s “Train Like You Fight” philosophy. 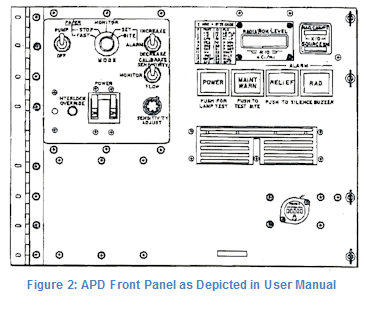 After creating the simulated APD front panel, the APD technical manual was referenced to gather accurate information and operator procedures. Written training procedures were reproduced in the CBT software. Lessons taken by the trainee were typically followed by a multiple choice question test or a practical test. Practical tests required the user to perform a series of operator actions while the CBT dynamically tracked the user to ensure the correct actions were performed in the correct sequence. One advantage to employing our style of computer based training, specifically with equipment simulations used to perform practical tests, is the opportunity to avoid potential damage to actual equipment when incorrect actions are performed. A failed multiple choice or practical test in the Orbis APD CBT required the trainee to repeat the applicable lesson, but didn’t cause any damage to an expensive piece of military hardware. Additional features incorporated into the APD CBT included video presentations, the use of wav files to reproduce sounds like audible alarms, tracking individual trainee progress pertaining to lesson completion and testing results, and generating a certificate when the trainee successfully completed all lessons. Orbis’s APD CBT application is a great example of how LabVIEW can be used to create a versatile software program for any training application. If you have any questions, please do not hesitate to contact us. We would be happy to discuss the particular needs of your application.